The government has come under renewed pressure this week over its swingeing cuts to departmental research and development, shown by the Science, Engineering and Technology statistics released last year. The cuts have been highlighted by articles in the Financial Times , Research Fortnight and a follow-up blog post from the Campaign for Science and Engineering (CaSE). 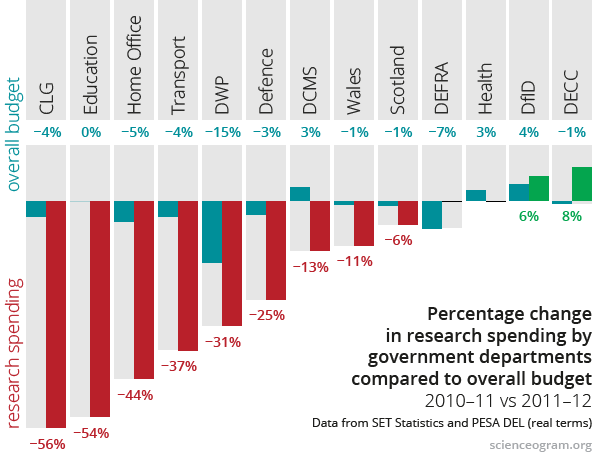 Scienceogram produced the following graph, showing the disproportionate cuts to departmental R&D when compared to cuts to overall budgets in those departments. ‘It’s difficult to marry the Chancellor’s enthusiasm for science…with the severe pressure on departmental R&D both through budget cuts and consideration of the future of our national research institutes,’ CaSE Director Dr Sarah Main told Research Fortnight . Freedom of Information requests by CaSE also showed that these cuts to R&D had occurred without any of the departments consulting the Treasury or the government chief scientist, contravening official guidelines. We at Scienceogram also responded to the SET Statistics when they were released last year. The data used in this analysis are drawn from the SET statistics 2013 and the Treasury’s PESA data 2013. Real-terms expenditure on R&D with a base year of 2011–12 is compared to total resource Departmental Expenditure Limits (DEL). This comparison is therefore between expenditure and budget figures, in the absence of official data on total departmental expenditure. This is a limitation of the analysis, but the conclusions are not expected to be affected by this. The Department for Business, Innovation and Skills was excluded from this graph because its increase in R&D spending was caused in large part, if not entirely, by the appropriation of budgets from the ‘research councils’ which fund academic science in the UK. Northern Irish departments have been excluded from our graphic because the 2011–12 figure is not comparable with previous years. (Further details can be found in our previous blog post). Other missing departments are due to a lack of equivalence between departments listed in the SET and PESA datasets.